Since many of you were loving the modern french tips post and asking more... I thought I would let you in on tip. 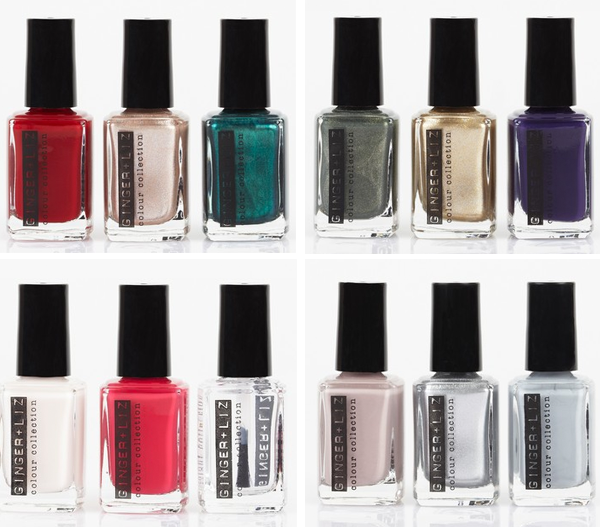 Today is the first time I've heard of Ginger and Liz nail polish (as it is on Hautelook today) and the colors look down right fantastic. I am having such a hard time picking colors, I want them all! Do you have any color selecting advice? See all of the awesome colors over here. What would you choose? In the past I have been widely turned off by nail polish in general because all of the toxic chemicals you are essentially putting on your nails that seep into your system, but when I find brands like Ginger and Liz that are toxic-free I am on board. Do you worry about toxins and stuff like that? I'm kinda nerdy that way and actually look up cosmetic chemicals and their side-effects while shopping in the store, I've been embarrassingly caught a few times by friends wondering what I was doing, now you know... haha. i love it when i find non-chemical nail polish!ill have to try this brand out. I do the same thing! Except I enlist my friends to distract the salespeople while I pour over the ingredient list. I find a lot of sales people get annoyed when you start reading the ingredients. i love that dark purple. i would take that gold and the lovely shimmery army green next to it! i started using Priti polishes + will have to try this one out! my husband owns an eco-friendly store (http://www.thegreenlifecostore.com/) that carries bath, body and beauty products (in addition to much more!) + he recommends the Environmental Working Group's Cosmetic Safety Database. it provides a # ranking of hundreds of products on the marketing + tells why they are safe or dangerous. 0 is safest, 10 is worst + everything he carries in the store is a 4 or below, with most as 1's or 2's! I just looked at their website and the colors are great. Thanks for the tip! loving that steely gray with a hint of sparkle. so fresh, love it! Hi, first time commenter here! I just had to comment on this one -- I, too, am a closet chemical-checker when it comes to cosmetics. I think it makes sense. Why put things on your skin and nails that are toxic??? Thanks for sharing this!